I have a neighbour who is almost 84. Last summer, she fell and needed some help for a while, and my daughter and I helped her by visiting every day and doing her grocery shopping from time to time. We have become close friends (she came to our house for Christmas dinner) and we still go over at least twice a week to check in on her and get caught up on each other's lives. Last week, when I was there, she told me that she had to go get a birthday card for her daughter's mother-in-law (is there a name for that relationship? ), who is celebrating her 90th birthday. These two ladies go to the same church and are good friends, but I think that my neighbour secretly (or not so much) loves the fact that this lady is significantly older than she is! Anyway, since the Hallmark in our local mall has closed, I offered to make the birthday card and this is the result. I find it hard to make cards to order - I much prefer when people go through 'my box' and choose something they like. This was especially hard, since I have never met this lady (although I've heard a few stories!) and my neighbour really didn't have a lot of design criteria for me. But it's sunny and cheerful, so I hope it will be well-received (although I hear she can be a tough audience! lol!) I'll let you know how it goes! Wonderful story! You have to be the sweet neighbor ever. Your made to order card is so perfect and I am sure will be loved much more than a Hallmark. Sweet story! I am sure she will LOVE your card! It is bright, fun, bold, and cheerful, who wouldn't LOVE it?!! Oh how sweet. Your neighbor is blessed to have you! I'm sure she absolutely loved it..and the recipient will too! Thank you so much for saying you find it difficult to make cards to order. I thought I must be the only one who has a hard time with that! LOL! Even though I know the person must like my cards or they wouldn't ask me to make a card or cards for their use, I'm always afraid they really won't like what I come up with for their "special" order. This one is lovely! I can't imagine her not loving it! You are truly a good person Ardyth! Your neighbor is blessed to have someone like you in her life....especially someone who rocks the card making world with her talent....like this bright 'sunny' card for someone who is celebrating 90 years of living! Great card - I'm going to leave a "practical" comment. For me it ticks all the boxes of giving a card to someone who is 90. Texture (those layers). Bold Printing. Bold Colors. I know my eyesight isn't as good as it used to be so I can only imagine being 90. She should love the card unless she has a weird aversion to sunshine yellow and there is just no way we as card makers can know every recipient's nuances. What a great neighbor you are! Great story. I think this will be perfect for the occasion! I think it's brilliant. Love the bright colour and the touch of sparkle. I'm sure it will be very well received! Fabulous card to celebrate a milestone! What a wonderful thing to do for your neighbor, Ardyth! I know she will appreciate it. It's so cheerful and fun. Love polka dots... love yellow! So definitely love this! I don't think you have to lose any sleep over this one ... she'll love it of course! The big numbers and glitter are perfect. 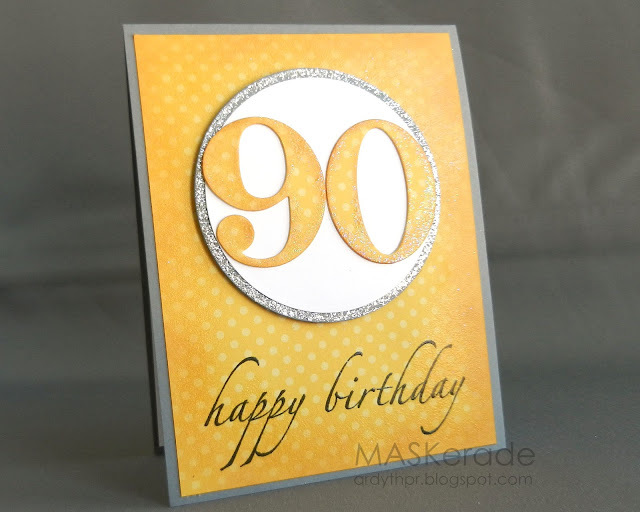 If you're going to turn 90, you're gonna want to have this card to go with it! Pretty card! I love the bit of glitter you used! It adds a great touch to the card!